From the author of Apocalyptic Planet comes a vivid travelogue through prehistory, that traces the arrival of the first people in North America at least twenty thousand years ago and the artifacts that tell of their lives and fates. 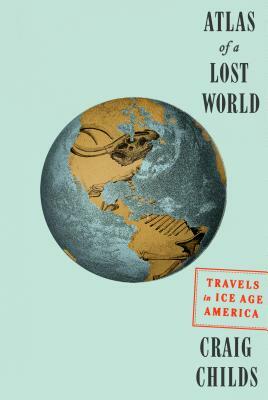 In Atlas of a Lost World, Craig Childs upends our notions of where these people came from and who they were. How they got here, persevered, and ultimately thrived is a story that resonates from the Pleistocene to our modern era. The lower sea levels of the Ice Age exposed a vast land bridge between Asia and North America, but the land bridge was not the only way across. Different people arrived from different directions, and not all at the same time. The first explorers of the New World were few, their encampments fleeting. The continent they reached had no people but was inhabited by megafauna—mastodons, giant bears, mammoths, saber-toothed cats, five-hundred-pound panthers, enormous bison, and sloths that stood one story tall. The first people were hunters—Paleolithic spear points are still encrusted with the proteins of their prey—but they were wildly outnumbered and many would themselves have been prey to the much larger animals. Atlas of a Lost World chronicles the last millennia of the Ice Age, the violent oscillations and retreat of glaciers, the clues and traces that document the first encounters of early humans, and the animals whose presence governed the humans’ chances for survival. A blend of science and personal narrative reveals how much has changed since the time of mammoth hunters, and how little. Across unexplored landscapes yet to be peopled, readers will see the Ice Age, and their own age, in a whole new light. CRAIG CHILDS is the author of Apocalyptic Planet. He has been a regular commentator for NPR's Morning Edition, and his work has appeared in The New York Times, the Los Angeles Times, Men's Journal, Outside, The Sun, and Orion Magazine. Awards he has received include the Ellen Meloy Desert Writers Award, the Rowell Award for the Art of Adventure, the Sigurd F. Olson Nature Writing Award, and, for his body of work, the 2003 Spirit of the West Award.